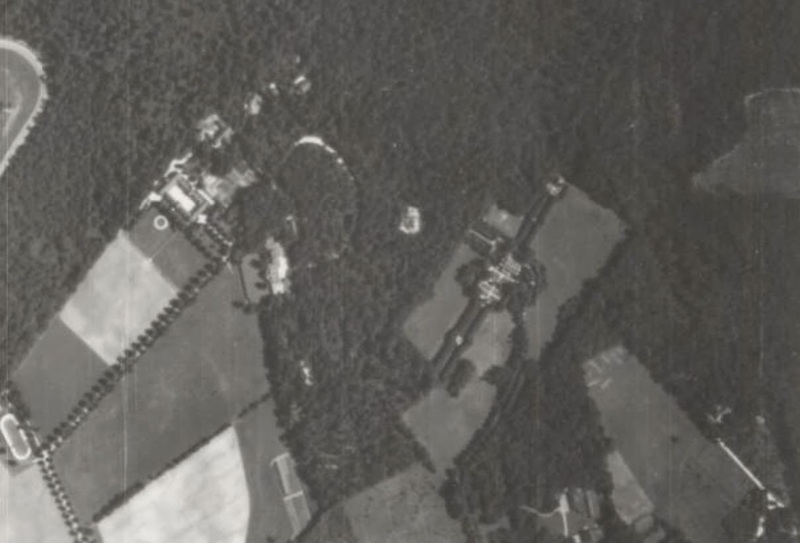 A 1938 aerial of 'Broad Hollow House', the F. Ambrose Clark estate designed by Rogers & Zogbaum c. 1912 and 'Longfields', the William Payne Thompson estate designed by Carrere & Hastings c. 1910 in Old Westbury. Click HERE for more on 'Broad Hollow House' and HERE for more on 'Longfields'. Photo from Stony Brook University's Digital Archive. I just find it odd how strangely close these estates are to each other. It is odd. Must be due to the topography. It does seem like in the period of only 50 years these great behemoths appeared and then disappeared from view. The Gold Coast only consisted of maybe 20 miles by 10 miles (very rough guess) so people were kind of jammed in there I guess. An older acquaintance of mine told me of visiting Jimmy Donahue at Broad Hollow and of the antics that went on there. Shocking! Reading your wonderful memorials of these houses, and seeing them in their decaying condition, reminds me of the sadness and tragedy that seemed to weave itself through the wealthy families of the Gold Coast. The Woodward family, decimated by Billy Woodward's shooting in 1955, lost an entire branch of the family tree to suicide by 1999. Same with the Woodward's great friends - the Bakers, where it seems each generation has lost a namesake, either by suicide or in a plane crash (said by some to be suicides as well). I've always wondered why. I live at the Eastern end of what was the Gold Coast, in Centerport, which has just one Vanderbilt home, so I have greatly enjoyed reading your posts here. Thank you. @Jon "An older acquaintance of mine told me of visiting Jimmy Donahue at Broad Hollow and of the antics that went on there ..."
I believe Donahue's connection was with Broadhollow estate [one word] which is not the same (yet confusing obviously) as Clark's Broad Hollow.